Luscious indigo colour in an easy to use form! The indigo blue color has played an important role in several cultures throughout history. There are an astounding number of books that are just devoted to this one dye. The famous Blue Men of Morroco are a north African tribe who dress from head to toe in indigo dyed fabric. Natural indigo takes a considerable amount of effort to get it into a working dye bath. First off, it is not soluble in water. So, you need to reduce it chemically with Sodium Hydrosulfite and lye. It is very involved and can be time consuming. 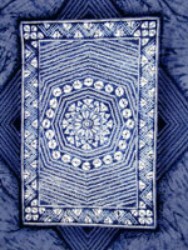 As an alternative, Jacquard has developed a pre-Reduced Indigo. You still need to add Sodium Hydrosulfite, but the lye is replaced by Soda Ash. It only takes about 10 minutes to prepare the dye bath and you get the same unique results as with regular indigo.